The most common time of year for children to develop a middle ear infection (acute otitis media) or glue ear (otitis media with effusion) is not surprisingly October to February. They can, however, develop at any time of year. 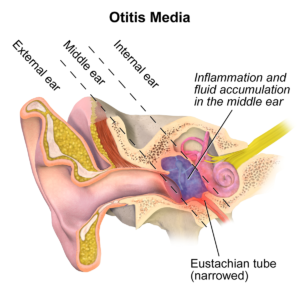 The middle ear (the space behind the eardrum where tiny bones pick up vibrations and pass them along to the inner ear) is connected to the upper respiratory tract by a tiny channel known as the Eustachian tube. Germs that are growing in the nose or sinus cavities can climb up the Eustachian tube and enter the middle ear to start an infection. The middle ear is also supposed to be well ventilated and when it is not due to the Eustachian tube being blocked, the area can become damp, stagnant and warm….perfect for germs. Children are particularly prone to Eustachian tube blockage because their tubes are narrower in diameter, more horizontal in orientation, and closer at the nasal opening of the Eustachian tube to the adenoids. Glue Ear is when the middle ear gets filled up with fluid, resulting in the little bones responsible for carrying sound vibrations not being able to move freely, therefore resulting in difficulty in hearing properly. I usually like starting off with looking at why a child might have developed an ear infection? Do they feel overwhelmed at Kindergarten and need some time at home with mum and dad? Are they having to face a new development that they are finding hard to stomach….such as needing to be more self-sufficient e.g. staying in their beds at night or being potty trained, stopping breast feeding. That usually is a good place to start to know what treatment to give. This is especially useful in cases where the child is having infections repeatedly. And there are many homeopathic remedies that can help depending on the cause. Aconite ear drops (Aconit Ohrentropfen) from Wala. Onions for doing an ear compress (Heat whole onion by boiling, cut in half, wrap in a cloth and place on the affected ear…make sure its not too hot!). Chamomilla C30 – angry, impatient, nothing pleases, wants to be carried briskly and rocked. Homeopathic remedies are often more effective than antibiotics in treating ear pain and infections. The pain and inflammation often start in the middle of the night and most doctors recommend just waiting and watching rather than running to the hospital for antibiotic treatment. But rather than just waiting and watching, giving remedies to help settle a distressed child is obviously a much better option. If your child has a tendency to get ear infections, make an appointment with me and we can discuss which remedies you should stock up with as well as giving your child some constitutional treatment to strengthen them during the colder months. I am offering a special offer for October and November – A 20€ discount off a consultation for children with ear problems. Please email me to book or find an appointment online.